Animal adoption for wildlife is another of the many ways that we can all help support Australia's wildlife. It's a great feeling knowing that any support or sponsorship that we can give really does make a positive impact on our wildlife - not just for now, but into the future. Every name given to the species that The Land Down Under adopts, is named by the mates of The Land Down Under who follow us on Facebook. The people are given the chance to put forward their ideas for a name and then the picked by the people from the names submitted. Then we have all adopted and supported that particular species! October 26 2014 - Adoption of a Leadbeaters Possum, named BUNI. 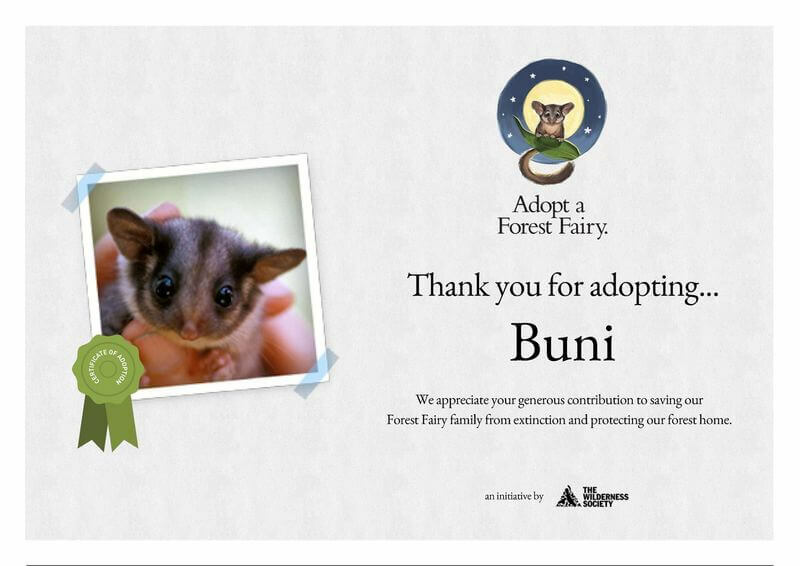 By us adopting a Leadbeaters Possum, we are helping to raise awareness of their plight. Victoria’s very own animal emblem - the (Leadbeater's) Fairy Possum - is facing extinction with less than 1,500 remaining in the wild. Why? Because what remains of the Fairy Possum's habitat is being logged and subsidised by the very state government it supposedly represents. By raising awareness and funds, is helping to push the Victorian Government to save the Fairy Possum's habitat by creating a new 'Great Forest National Park'. Buni was put forward by Jill and means Home of the Possum. 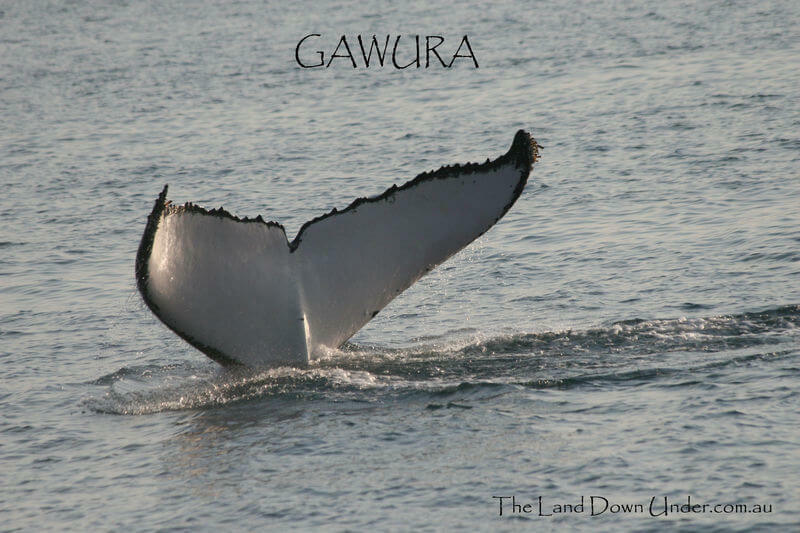 July 17 2013 - Adoption of a Humpback Whale – named Gawura. IFAW’s Humpback Icon Project (HIP) gave communities the opportunity to adopt a humpback whale. 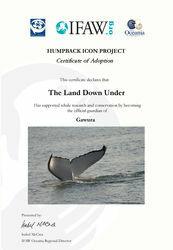 From Rottnest Island in Western Australia to Hervey Bay in Queensland, Australian communities and councils were able to adopt a unique whale to be their local whale icon. 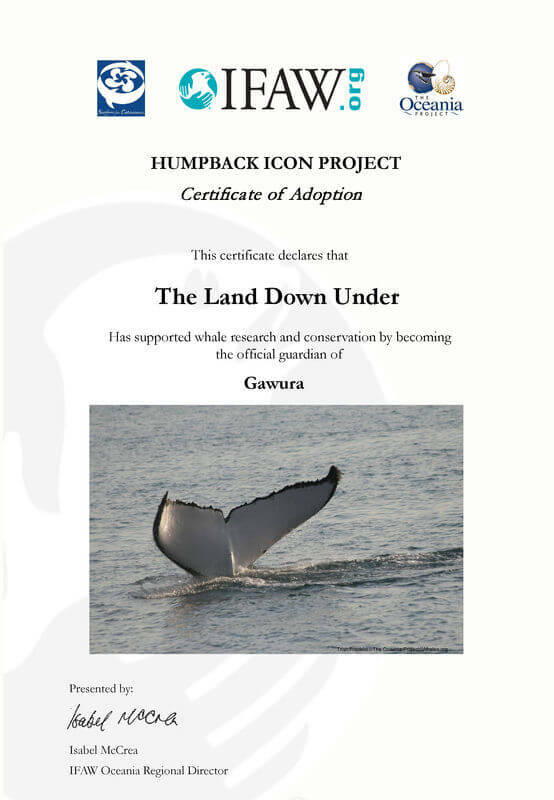 The Land Down Under is an online community and we weren’t sure if we were able to adopt a whale, but we contacted IFAW and after some consideration we were able to Adopt a Whale on behalf of The Land Down Under (community) mob. Every humpback whale has an individually patterned fluke, which, like a human thumb print, allows for them to be recognized and tracked.